The Healing Power of God is Made Manifest via the Living Word. "Verily, verily, I say unto you, He that believed on me, the works that I do shall he do also; and greater works than these shall he do; because I go unto my Father". 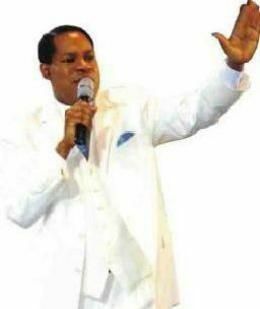 I have seen the manifested presence of God by His word through the teaching ministry of Pastor Chris. I have always desired to see the working of miracles as it was in the days of Elijah, Ezekiel, Jesus, Peter, Paul and other great apostles as the Lord made me to understand that they all happened and can always reproduce in all ages because of faith in word. Look God's word written (Logos) is not just a history book but it is the power of God unto salvation to them that believe. Faith in God will always produce results for without faith it is impossible to please God (Hebrews 11:6). Do you desire to know more of God plans for your life or sick in your body right now and it has been tagged incurable, i mean any form of disease that has a name, name it. I have good news for you as testimonies abound everyday on the great doings of the Lord in the lives of men, the past Night of Bliss with pastor Chris South Africa was really an atmosphere for miracles by the word of God. The Holy Spirit moved all over the venue and beyond, performing God's word. We are in the days of His power, with that little seed of faith in you, you can really effect a positive desired change! Start now to generate the inner energy that is at work in you by speaking in other tongues, suddenly your heart will be flooded with lights, your spirit will be tuned to receive from the spirit of God - Answers and solutions will be ministered to you. Praise the Lord, Hallelujah. The program was streamed live on the Internet through LoveWorld Christian Network, enabling many all over the world participate from the comfort of their homes with their Internet enabled computers and many others watched optimized live streaming on their mobile phones. Yes, they were all ministered to, by the power of the Holy Spirit via the Internet satellite thereby bringing to them the divine presence of God. They oppressed were all made free in Jesus' Name through the ministration of the spirit. 28th March 2008 Night of Bliss with Pastor Chris in South Africa....Awesome Testimonies! Truly, the entrance of God's word gives light. "Night of Bliss with pastor Chris" has indeed demonstrated the Power of God via His Word to bringing salvation and healing to the afflicted and the downtrodden by the working of miracles via the Word of God. Night of Bliss is here again as the atmosphere is fully charged for this year edition: Night of Bliss South Africa coming up soon in Johannesburg, South Africa on the 11th of March 2011. The Word of God works in all ages unto eternity and will come alive in your hearts as the man of God pastor Chris ministers by God's Spirit...The Word of God works! The entrance of God's word gives Light. Psalm 119:130. I'm quite grateful to God Almighty for His word that has brought to us light, salvation and eternal life. I remembered in the Bible what Jesus said about our relationship with the word of God. He said you shall know the Truth and the Truth will make you free. John 8:32. This was explicitly described by Jesus to his listeners and followers. I was concerned about knowing the truth that makes free until I realized that this truth that makes free is Life and Spirit. This also means that the word of God heard or read is Spirit and Life. John 6:63.
www.enterthehealingschool.org: Official site of the Healing School of Christ Embassy. No case is hopeless with the Word. I tell you, testimonies abound to the glory of God. www.pastorchrispodcast.com: Download Pastor Chris Messages and be on the go for FREE! www.rhapsodyofrealities.org: Get updates about Rhapsody of Realities daily devotional. www.nightofbliss.wordpress.com: Official Blog of Christ Embassy on the ever glorious and life transforming event of our time "NIGHT OF BLISS"
www.biblegateway.com: Complete Online Bible with various translations, versions and refrence guide. www.gobible.jolon.org: Download Complete Bible to your mobile phone for FREE! www.kcm.org: Kenneth Copeland official website. He is one of my mentors in the things of the Spirit. Jesus Christ the same yesterday, today and forever (Hebrews 13:8). I believe God's word works. It will surely produce in your life in Jesus Name, Amen. Your comments are welcome, also feel free to share your testimonies. Keep living in the atmosphere of miracles. Your faith is working now in Jesus' Name. Amen. You've become a blessing to people around you and beyond. Glory to Jesus! You're welcome. The atmosphere is fully charged for this epoch event [Night of Bliss South Africa 2011] with Pastor Chris. On the 11th of March as scheduled, I believe for a transformation as the Word of God comes alive in the hearts of many that will be present, even anticipated online participators. Thank You Lord Jesus. Hallelujah!!! Countdown to the Night of Bliss South Africa 2011 - 4 days to go. Glory be to God Almighty. Wow wow wow! What a glorious night it was! Around 100,000 in attendance and SO many people received a miracle. The queues of people lining up to testify of their healing were numerous! Glory be to God! Pastor Chris really loves the people of South Africa! And the Word of God is really at work in the great nation!